Dinosaur Comics - October 10th, 2006 - awesome fun times! ATTENTION FIREFOX USERS: here is a clever script that remembers the last comic you read for my comic, as well as for Megatokyo and Sinfest. It is pretty clever! Thanks, ecmanaut! Also while we're talking Firefox here is a patch that corrects Firefox's 6-year-old and still unfixed title text bug, which you might also want for reading my comic. Finally I just got that problem, the one where all your emails since January get suddenly erased forever, so if you've sent me something in the past little while that requires a response, please to send it again! 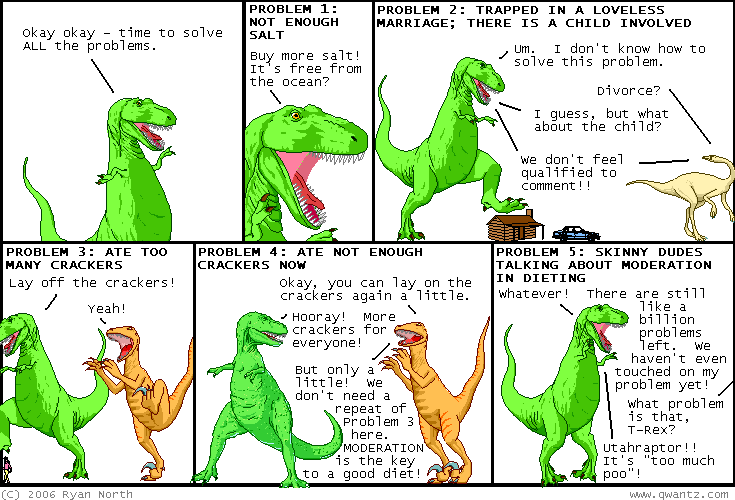 One year ago today: intelligent design comics, featuring: talking dinosaurs coexisting with humans!